Once again it's time to start thinking about Reading Challenges for the new year. 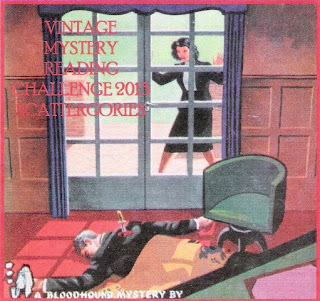 And once again I will be sponsoring the Vintage Mystery Reading Challenge. This year I'm offering a bit of a smorgasbord with a theme of "Scattergories." You will see listed below a set of Vintage Categories. Your mission, should you wish to accept it, will be to fulfill at least 8 of the categories. Feel free to get creative with the categories--if you can make a book fit the category and sell the fit in your review/comment, then it's in. *I am open to additional category suggestions. Please email me (phryne1969 AT gmail DOT com) with your suggestions. Once I decide to add a category and it shows up on the list below, then it will be fair game for challenge completion. Category suggestions will be considered through January 31. *Challenge runs from January 1, 2013 to December 31, 2013. Sign up any time between now and November 30, 2013. Any books read from January 1 on may count regardless of your sign-up date. If you have a blog, please post about the challenge and your theme commitment. Then sign up via one of the linkys below. And please make the url link to your Challenge post and not your home page. (Links that do not follow this rule will be removed.) Please use the appropriate linky for the mini-challenge. *I would love to see reviews of your challenge books, but it is not necessary to participate. If you do not have a blog, post to the comments what your challenge commitment will be and then post again at the progress site (see below) when you have completed your challenge (include a list of books read). If you don't review and you've gotten creative with the categories (i.e. it's not obvious how a certain book fits a category), then please give a brief explanation when you post your completion comment. *Everyone who completes the 8 book minimum will be entered for a prize drawing at the end of the year. Anyone who completes 16 or more books will automatically receive their choice from a prize list. *Once you have met the 8 book minimum, you may repeat any category (except the last one) any number of times to reach the 16+ level. *Progress and Reviews should be posted HERE (click link). Mini-Challenge Level--for those who would like to participate at a lower commitment. Choose any 4 categories for a commitment of 4 books. Challengers who complete this level will be eligible for a separate year-end prize drawing. 29. The Old Bailey: a courtroom drama mystery (Perry Mason, anyone? Witness for the Prosecution...etc.) OR a mystery featuring a judge, lawyer, barrister, D.A., etc. 30. Serial Killers: Books that were originally published in serial format, probably from the pulp era. Frank Packard's works come to mind. 31. Killed in Translation: Works that originally appeared in another language and have been made available in English (works published in English post-1960 would be acceptable, provided the original was published pre-1960). Georges Simeon's works come to mind. OR If your native language is not English, then works that originally appeared in English and have been made available in your native language (same dating rules apply). 32. Blondes in Danger: A variation on "Colorful Crime". Books that feature a blonde in the title role, like The Blonde Died First, or Blonde for Danger. 34. Somebody Else's Crime: Read one book that someone else has already reviewed for the Vintage Mystery Challenge. Will soon do a sign-up post. Thanks for hosting it once again. Oh, yeah! I'm ready to start. Darn...over a month and a half to go. I'll be back to sign up after I've finished this years! I was rather ambitious this year and I only managed to complete one of the three lists of eight I thought I'd do. But of course I'm signing up again! Please tell me the name of the book from which you took the DJ illustration for next year's logo. I know it's a Boardman edition of something, I can see the Bloodhound logo at the lower left. But I haven't a clue which book. Maybe something by Wiliam Campbell Gault? Hm, very tempting...I just discovered that Christianna Brand wrote mysteries! (From here, maybe?) I only knew her as Nurse Matilda and cousin of my favorite illustrator, Edward Ardizzone. Oh my gosh. I am very excited. Off to compose a post to join the 2013 challenge. The categories sound great. Wow, this took some time setting up! I don't usually read the older mysteries so I've got to think a bit more. I have signed up now. This will be fun. I still have two to review and one more to read and review for the 2012 challenge. Yay! Love the Scattergories, Bev! Looking forward to start reading and trying to fit my books in the categories. Bev, your categories are awesome! It would be so cool to try to do them ALL, LOL! I have never read a Vintage Mystery, and I so appreciate the Mini-Challenge option so that I can try them out! Bev, thanks for fixing my link-up. I didn't realize that there was a separate linky for the mini-challenge. No problem, Darlene. I'll have two prize drawings and wanted to keep things organized. I'm in this year. I'll link up my most as soon as I write it. I'm working on my post now - the only other category that I could think of would be "Hobby Lobby" mysteries featuring a hobby. Mine would be about scrapbooking, if I can find any tales that were published pre-1960. There are several series now that are too new to qualify. Newbie here...to the challenge and to the genre. I have read a few Agatha Christie novels, but that's it. Ready to dip my toe in! Thanks for hosting again! I wrote my sign-up blog post a month ago, but forgot to post it. I'll have a review up soon. I started to collect older mystery novels a few years ago at antique stores, small indep book stores and the like. I can't wait to dig through them and see if the ones I haven't read fit any categories. I would like to try for 16 books read. Thanks, 2013 is starting to look up. Welcome Mic! Glad to have you join us! I'd like to sign up and try to read 16 books. This challenge looks very interesting and it might help me to read more. Anyways, thanks for hosting this challenge. I will write a sign-up post on my blog shortly. Bev, I've tried to post my sign-up blog post several times, but it doesn't seem to go through. Today I got the message that I was already linked, but my post doesn't show up on your list. Perhaps you can help. I just found out about this challenge! It is definitely the one for me, I love vintage mysteries! Thanks for hosting this challenge! Just stumbled on this challenge--right down my alley! Do audio books count toward the challenge or do they have to be visually read? I hope the other participants reading this can excuse me for coming late to the party (five days before the deadline). I’ll admit to having read about the contest a few months ago, but I was reluctant to sign up, since I don’t have a blog and didn’t think I could commit to keeping up with posting comments each time I finished a book. However, I’ve read quite a few vintage/Golden Age mysteries this year, even more than usual. Some were very good, some very obscure, some both. It would be fun to share short (sometimes very short) comments about the books and perhaps introduce some people to writers as little-known (I assume) as M.M. Mannon, Susannah Shane, H.C. Branson, and Margerie Bonner. I keep a computer list of all the books I read, so it was easy for me to separate out the Vintage mysteries from the others. I’m in the process of matching as many of them as I can (retroactively) to the categories in the contest. I’ve checked with Bev, and she said it would be permissible for me to sign up here and then at some point in December (once I’ve completed a list of books read, categories they fall under, and brief reviews), post a link in the wrap-up section to a page I’ll place on my seldom-used web site that would contain all the information. I already have short (one- to three-sentence) reviews I made for myself as I finished reading a book, and I hope to slightly (possibly more than slightly in some cases) expand most of these for the final wrap up document. It turns out I’ve read 22 Vintage mysteries this year, and I think I can fit most or all of them into one category or another. I apologize to those who took the more disciplined approach of determining books and categories in advance and posting on their blogs as they went along. Gary: So glad to have you plunging in (even at the last minute). Can't wait to see your list and, yes, you are tempting me with those little-known names you've dangled in front of us. I'm betting you haven't stumped John from Pretty Sinister Books though. Hope you'll consider joining us for the 2014 version of the challenge (see my sidebar for the link--just click on the picture). You are welcome to post a comment saying you're in for Bingo. Feel free to print the Bingo cards and then let us know on the review/wrap-up site (coming soon) what bingos you make.